The Gold edition of the new installment of the Assassins Creed series, Assassins Creed called Unity, is the combination of the original game, in its special edition, with the Season Pass of the title, which will also give us access to all the DLC that go throwing. In this new installment of Assassins Creed, which this time will be set in the city of Paris during the turbulent period of the French Revolution, we can enjoy an audiovisual unprecedented deployment of the franchise, thanks to the power of the new graphics engine Anvil. In addition, the map where we can move has an area three times larger than the previous installment, the Assassins Creed 4 Black Flag. 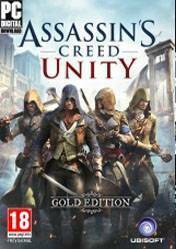 This Gold Edition includes the original game Assassins Creed Unity with extras from the special edition, as the mission The Chemical Revolution, and unique weapons as Royal Arsenal Pack, Athos Duel Shirt, Black Breeches and Pappenheimer Rapier Musketeer. Besides all these extras, we also provide the key to Season Pass, so we will be able to access all the extra content.